According to J. 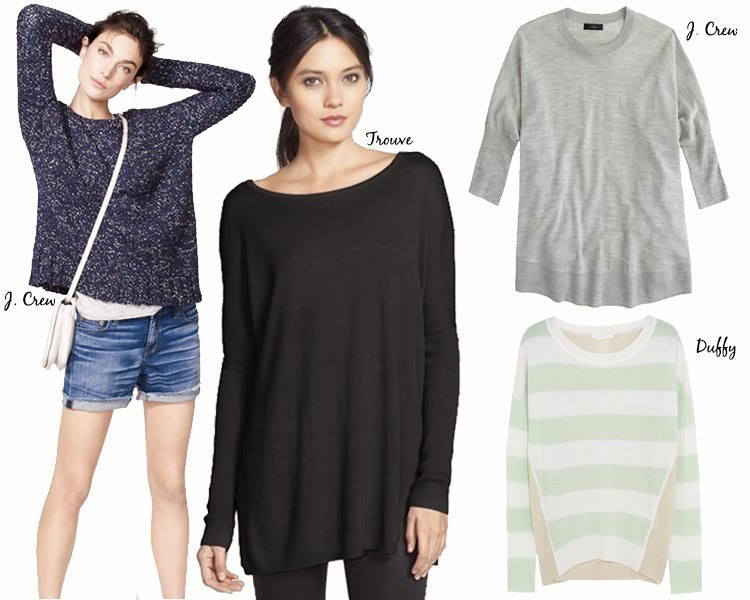 Crew's January 2014 catalogue, "swing sweaters" are the new knitwear silhouette. With a boxy bodice and fitted sleeves, this style sweater is the most perfect way to stay cozy and comfy while not losing any bit of style. The loose fit of the body is as effortlessly cool as you can get, while the slim sleeves keep the sweater sleek rather than schlubby. I have a similar sweater to the black Trouve one shown above, and I must say it is quite fabulous. I can slip the sweater on and have that breezy feel while never feeling like it weighs me down. A boxy sweater is perfect over skinny jeans or cuffed denim shorts - keep your bottoms tailored and polished (pointed toes, clean hems, etc.) for best effect.